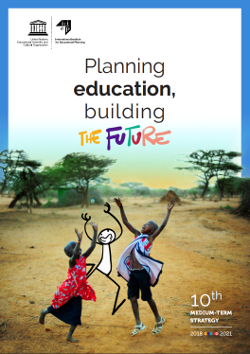 IIEP will continue to support governments in developing policies and sector plans that strengthen education’s role in preventing, preparing for, and mitigating crises. The Institute is committed to scaling up this work at global and country levels, while ensuring it is sensitive to gender dimensions. It will also address emerging global challenges, notably forced displacement, which affects not only host countries, but also countries of origin, whose education systems are left without the human resources needed to rebuild. In supporting countries as they plan for displaced populations, IIEP will promote innovative solutions, such as applying school mapping techniques to the challenges of population influxes. 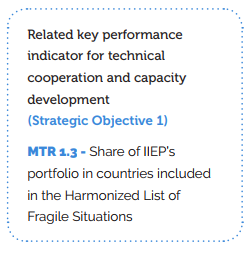 Alongside key partners, IIEP has developed comprehensive expertise, policy guidance, and tools for crisis-sensitive educational planning and management. In response to pressing needs, the Institute will bring education ministries and humanitarian and development partners together to explore new ways to plan for education in crisis-affected contexts. These include aligning humanitarian and education sector plans, and coordinating educational planning and policy development for displaced populations. This effort will involve global training, country-level capacity development, knowledge production, and policy advocacy. In this way, the Institute will support ministries’ leadership at the humanitarian–development nexus. Assist education ministries in developing, monitoring, and evaluating crisis-sensitive policies and plans. Work with international partners to develop strategies and guidance on preventing and mitigating conflict and crises through education. Train global education staff on crisis-sensitive planning, including education for refugees and internally displaced persons (IDPs). Provide new forms of training and technical support on planning for refugees and IDPs to ministries, humanitarian cluster members, the education sector and/or local education groups. Conduct research on the management of teachers of refugees to develop evidence-based policy guidance.